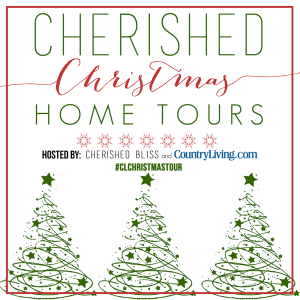 I am so excited to be a part of the Country Living and Cherished Bliss Christmas Tour this year. I usually go pretty simple with Christmas decorations, so I wondered how it would go down this year. Would mine be the only one with modest simple decorations? Well the homes I have seen are magnificent! An then there is mine…. a little bit different. Simple and restrained is what I like to call it. Some people call it ‘lazy’ but that’s okay. I don’t mind. 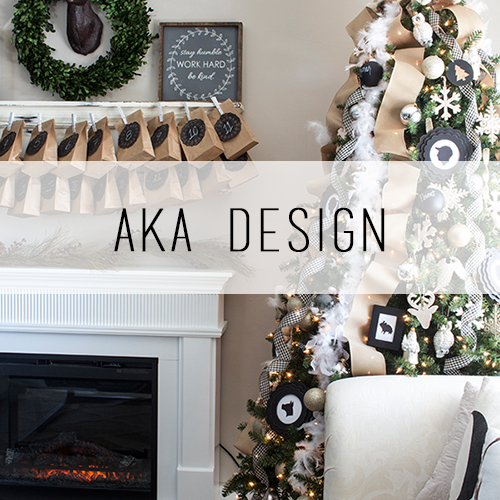 I have a lot going on and only have so much time to decorate. I figure you can relate. For those of you that haven’t seen Outlander, #JAMMF are the initials of one of the main characters, James Alexander Malcolm Mackenzie Fraser. It is set in 18th Century Scotland in Season 1 and they head to Paris for Season 2. If you haven’t watched it, I’ll attempt a little recap although as the actors say, it’s difficult to explain in 10 seconds. Basically Claire Randall was a nurse in WWII, then went to Scotland and touched some standing stones that caused her to fall back in time to the 1740’s during the Jacobite rebellion. She takes up with the Highlanders all the while having to hide her true identity. She is forced to marry a particularly handsome Highlander to escape torture at the hands on the red coats. Well that’s the gist of it. It’s very addictive, but pretty violent, so be warned. 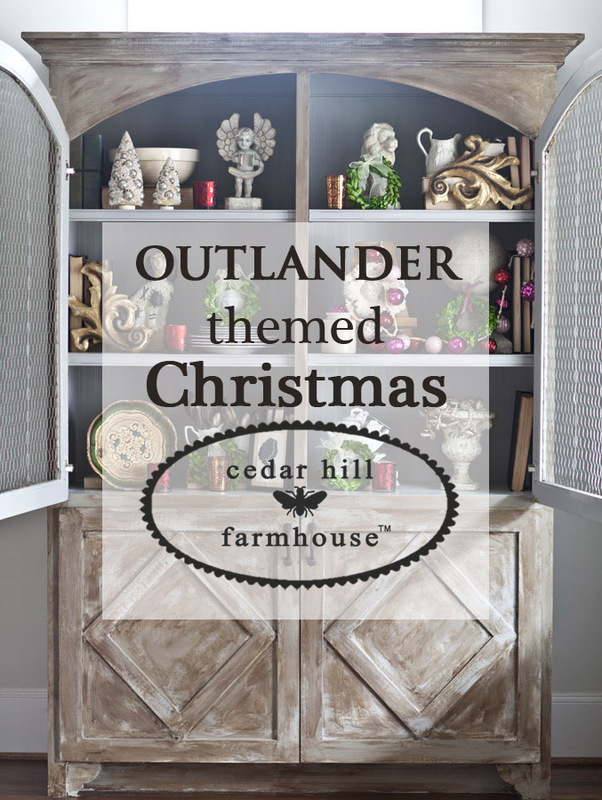 In keeping with my Outlander theme, I added some Scottish touches to my Farmhouse French style. My father’s family is actually from the MacGregor clan, and I have French ancestors as well, so it works for me. 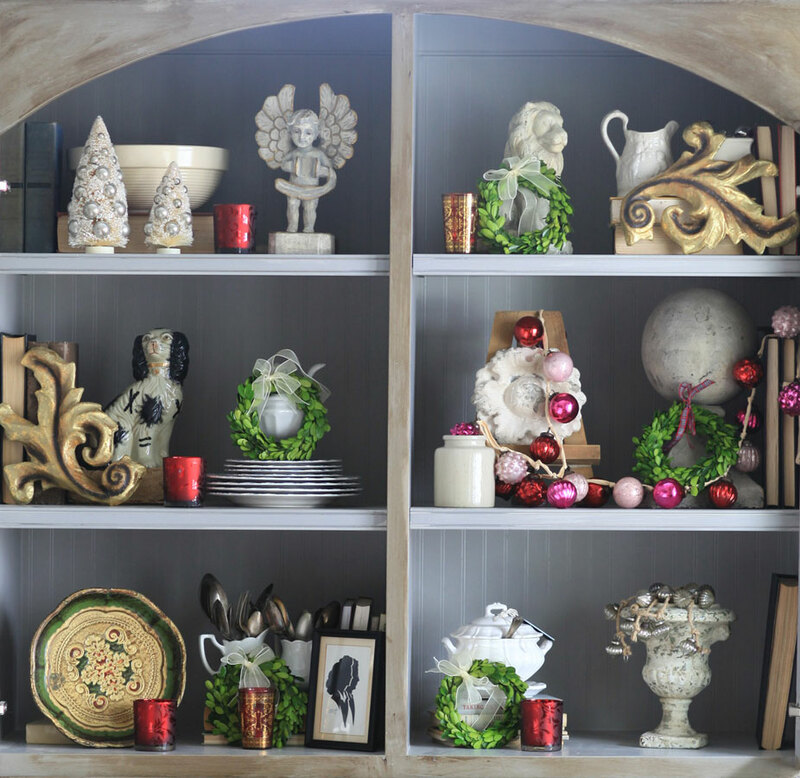 I added little boxwood wreaths, little red and pink votive holders, bottle brush trees, gold scrolls, and the pink mercury glass ornaments to my cabinets. I have several old items in here that either are antique or at least look it. The crockery is old. I added the Florentine tray with the green and gold for the holidays. Now above the fireplace I added the tartan ribbon I ordered from the UK just for my Christmas decor this year. 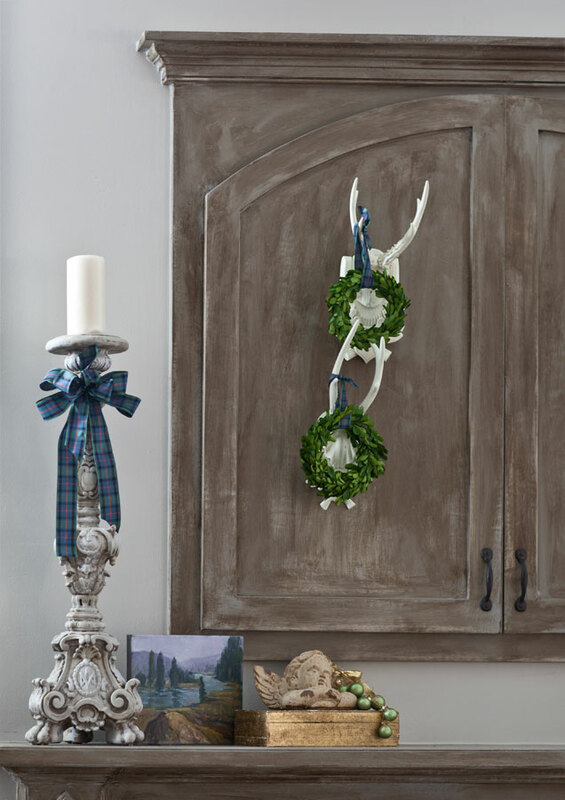 The tartan is ‘Flower of Scotland.’ The antlers although fake, have a bit of a Scottish stag hunting feel… sort of. The original oil painting I found at Round Top looks like it could be a painting of the Highlands. The angel sits on a gold vintage Italian Florentine box. I think it looks like it could be a part of Castle Leoch. I feel myself wanting to lift a glass and say “slàinte mhath” which is a drinking toast in Gaelic. Although the candle on the left is not so old, the brass ones on the right are quite old and were altar candlesticks from an old European church. 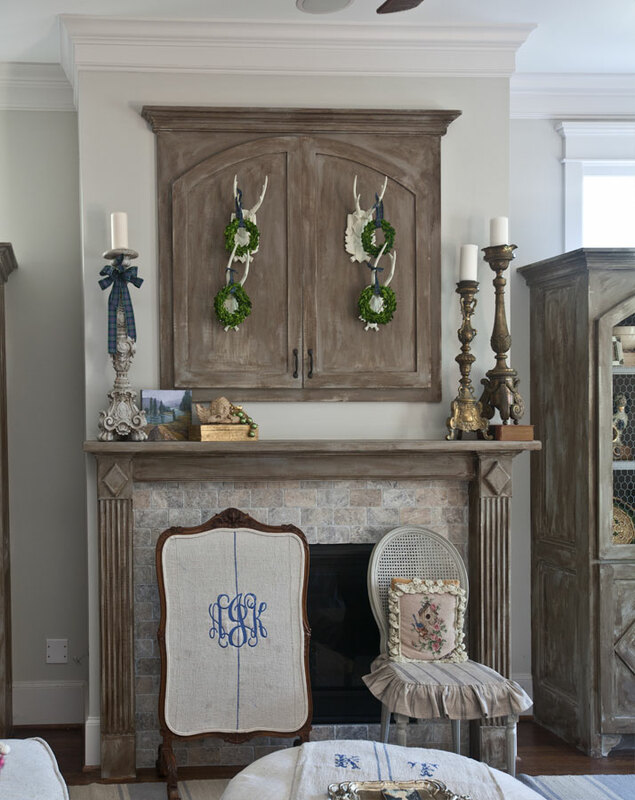 The fireplace screen is a French antique that I had recovered in antique grainsack fabric. I had it monogrammed also. The chair is a thrift store find. Can you hear the bagpipes yet? 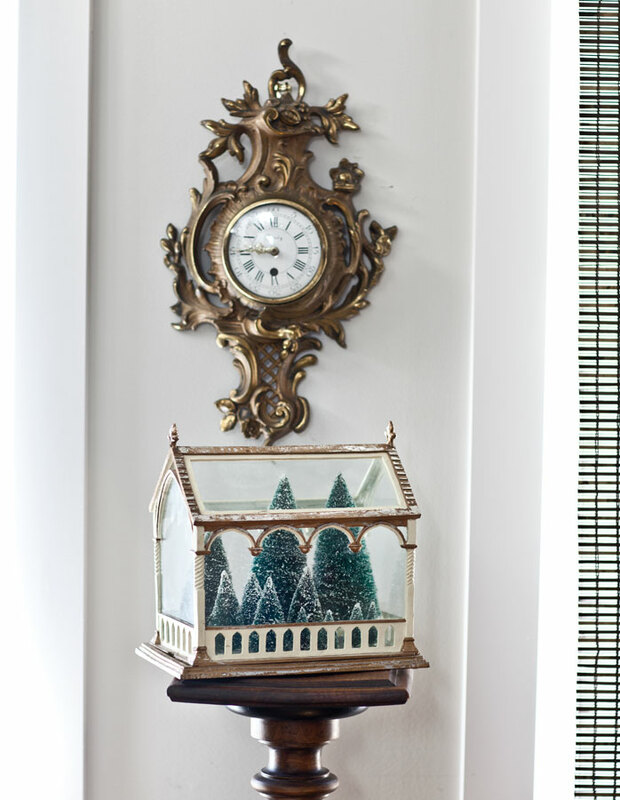 This old antique French styled clock might have been in one of the places Jamie and Claire stayed in France. Okay maybe it’s not quite that old, but the style is old. The miniature greenhouse is filled with small green bottle brush trees. What’s that? It looks like the Scottish Highlands in there? I think I spy Claire running from Black Jack Randall. Look at the detail on these candlestick holders. 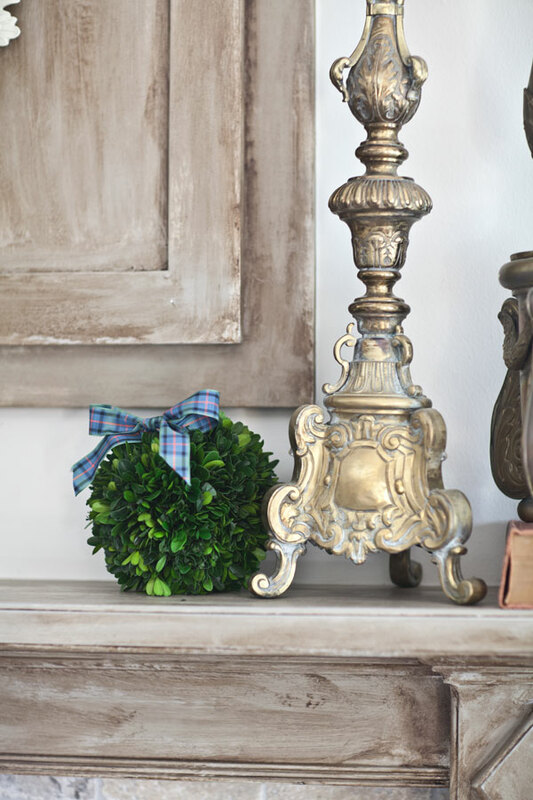 I added a preserved boxwood ball with a tartan ribbon for fun. 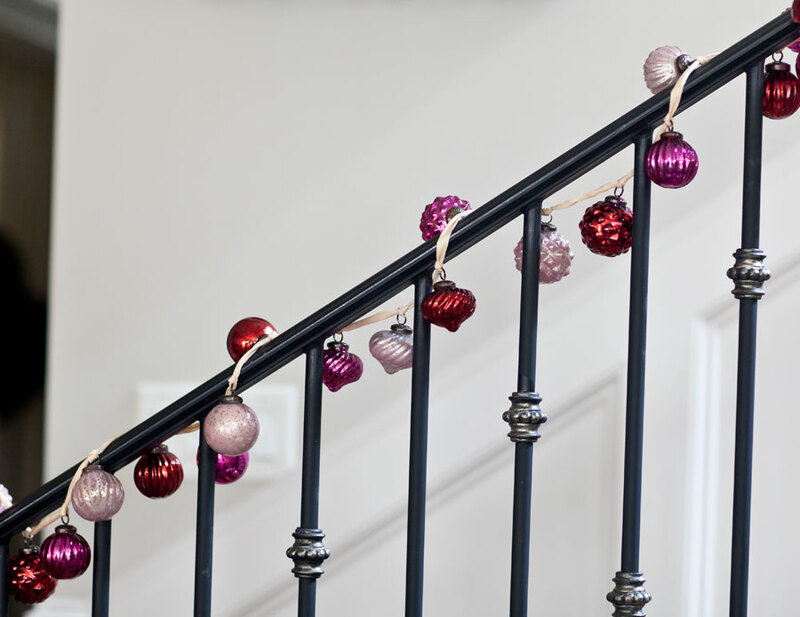 I love this mercury glass garland I used on the iron staircase baluster. I hand-painted the detail on the stairs. Here are the sheep out on the moors. 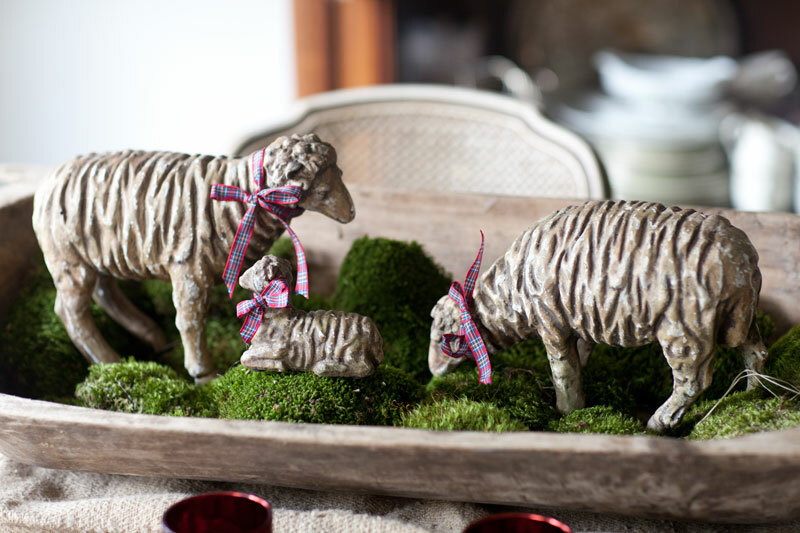 Oh no wait, that’s just some fake sheep in a dough bowl on my table. I found this old iron fence post in sad shape, but asked my builder to use it as the newel post. 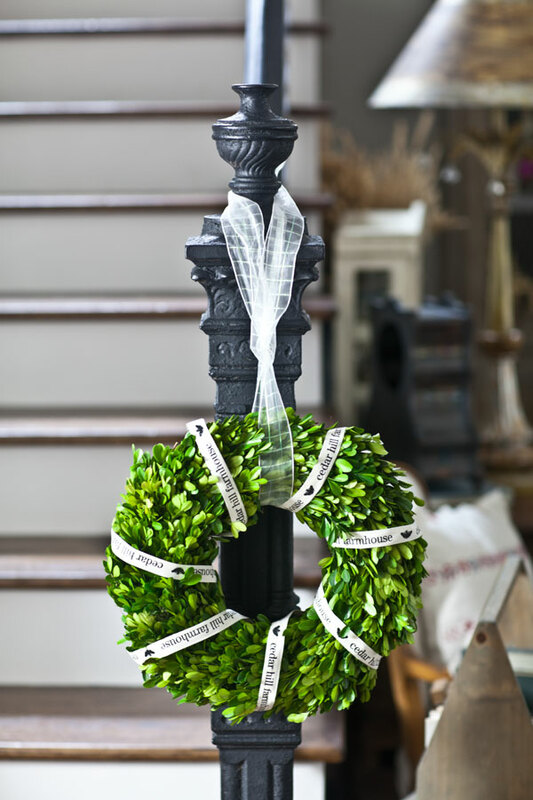 For Christmas, I hung this preserved boxwood wreath on the post. Of course in the 1740’s Scotland where Outlander is set, people didn’t do too much to celebrate Christmas. Based on my little bit of research, typically during that time, there would have been some special church services, and special feasts. Also they brought greenery inside, like ivy, holly and mistletoe. So a boxwood wreath isn’t too far off. Oops, my lamp shades are dated “1829” (although they are fairly new) so just ignore that. And here’s the Christmas tree which would be completely out of place in 1743. It’s covered with more of the mercury glass garland and lots of mini grainsack stockings. You can continue the tour on Friday at AKA Design. So very, very beautiful Anita. Your Christmas decor is just breathtaking. 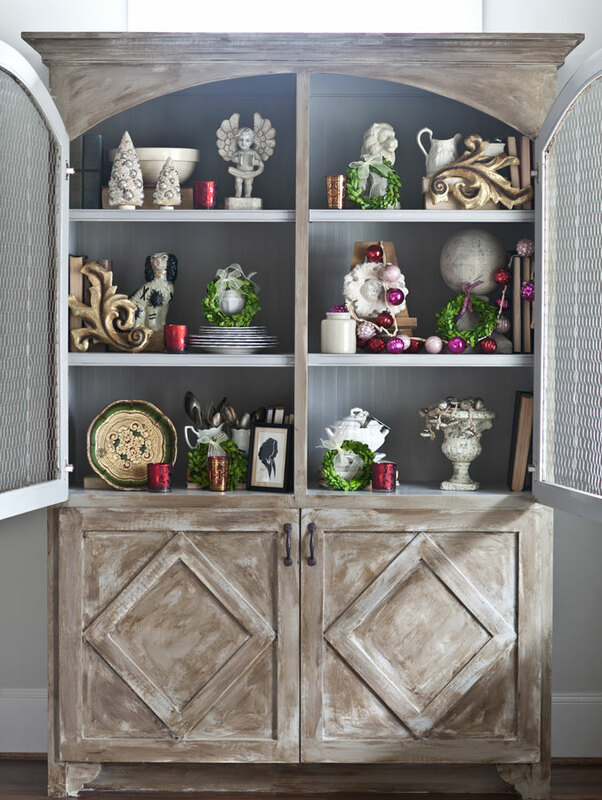 I look forward to seeing your home dressed for Christmas every year. Love each room and every wonderful detail. Anita, your Christmas decor is perfect! Love your theme! Very pretty Christmas decorations. Always fun to discover another Outlander fan! Yay that makes two of us! Your tour was exceptional and so were your decorations. I loved your story and i have watch the show i may cringe a little but i still enjoy it. Thank you for this wonderful tour of your lovely home. Love it! I’m a huge Outlander fan too and can’t wait for the new episodes! I’m also of French decent…my great-grandfather came to the U.S. with his parents as a boy in the late 1800s. He was born in Lyon. Merry Christmas! 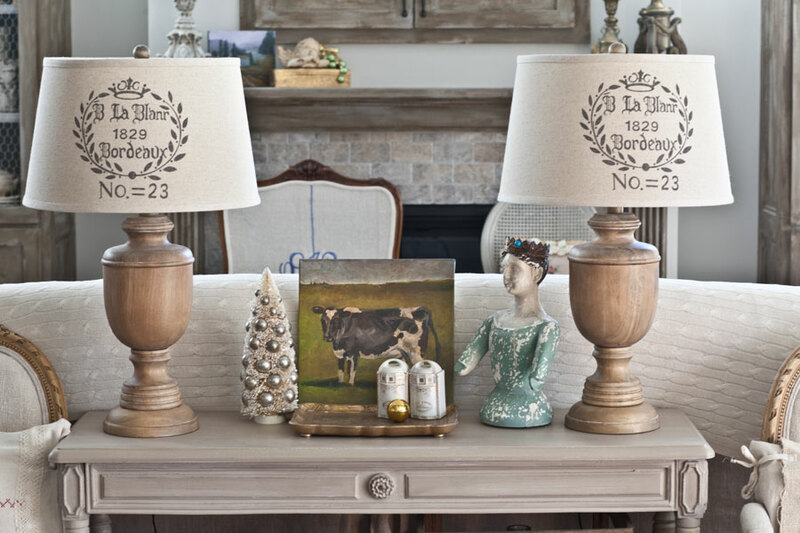 My favorite home tour so far – you had me at Outlander! Outlander. One of the few shows my husband and I can agree on, lol! Your home looks wonderful….gorgeous ribbon! Hi, I have been in love with Outlander and Jamie Fraser since the 90’s. It was so nice to find out that you are a fellow Outlander fan. Oh wow Maggie. I am a new fan. Anita your decorations are wonderful. I look forward to your newsletter every week and for the inspiration that inspires this new by. Your home looks beautiful, love your alter candle holders…..
Gorgeous tour Anita!! And I LOVE the theme. Outlander is my favourite book series- I’ve read it all twice and am anxiously awaiting the next book… though I fear I may be waiting for a while. Merry Christmas to you!! I luv it all! could you source your tree? I sure hope its artificial just looks amazingly real! Michelle, it is so old, I really don’t know. Sooo beautiful! I don’t know how I missed this in December but so glad I just read it. It really is beautiful! I read Outlander books well over 13 years ago and would anxiously await the next new book and loved the books. it is so wonderful how you decorated with the Outlander in mind, really love it. (I must be behind as I did not know they now had a TV series?) Where did you find the newer candlestick? Beautiful! 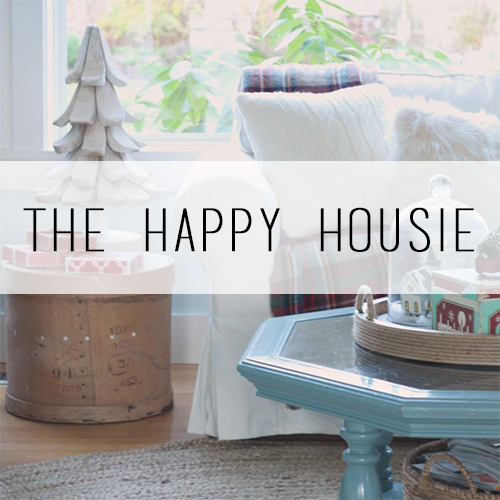 Again, so glad I caught up, love your blog and home.